The Burger Busters will go to amazing lengths to seek out and review burgers so that you don't have to. In this installment we went to the top of a mountain to sample a burger in a restaurant only accessible by a pleasant chairlift ride. I guess we could have hiked for several hours, but I was in no mood to carry a whining Happy Meal up and down a mountain.It was the last weekend of Happy Meal's Summer Vacation, and I wanted to end his Summer on a memorable note.We made the hour-long drive from LA to Mt. Baldy. This took us through Claremont, CA. Claremont is home of the Back Abbey--I hear that burger is great. Happy Meal and I ignored that siren's call and drove 10 or so more miles into the mountains to the chairlifts at Mt. Baldy. From there we rode among the treetops to the lodge near the top of the mountain. 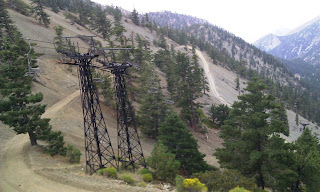 At the end of the ride, we walked over to the Top of the Notch Restaurant, AKA Mount Baldy Bar and Yacht Club. Happy Meal was immediately impressed by the free foosball. We ordered a couple of The Notch Burgers with fries at $10.25 apiece. Our burgers arrived in about 20 minutes. The Sear: The sear was pretty thorough. In fact, the dry discs that served as the foundation of our cheeseburgers were nearly vulcanized. 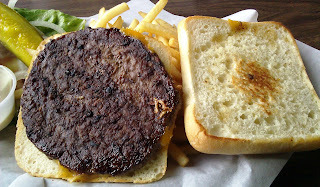 That sear did not positively contribute to the burger in terms of texture or flavor, however. The Preparation: The beef discs appeared to have been run through a charbroiling conveyor. The burgers had an even sear and grill marks. The Cheese: The cheeseburgers at Top of the Notch Restaurant came with a choice of Cheddar, Pepper Jack, or Swiss. We opted for Cheddar on our burgers. The Cheddar was bland and completely lost in the bite. 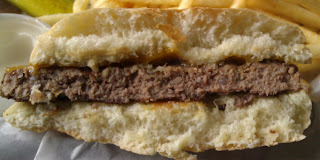 The too large bun and the dry beef rendered the cheese invisible to the palate. The Bun: The bun was a ciabatta roll. The bun was reasonably fresh. It was relatively bland, and it was not toasted sufficiently to give it any crunch. The Meat To Bun Ratio: The ciabatta roll dwarfed the 1/3-pound patty. The Fries: The fries at Top of the Notch Restaurant were fine. These were of the peel-off, par-cooked, and previously frozen variety. The thin fries were properly cooked to a nice crispness. They were finished with an appropriate dusting of granulated salt. The fries were a winner. The Toppings: Ugh...the tomato slices were hard and greenish. The Romaine lettuce leaves were flaccid. The Value: We had a Groupon. We spent $29 for two lift tickets and a $20 food voucher. We paid an additional $6 for the tip and drinks. That got us to $35 for a terrific experience but some really weak chow. Even with the discount, the value was mediocre. I certainly would never advocate that anyone venture to Top of the Notch Restaurant at Mt. Baldy, CA for the cheeseburgers. Happy Meal was duly impressed by the new experience. I was delighted to have shared it with him. Happy Meal handled his first chairlift ride like a champ. He also took down that burger like a pro. 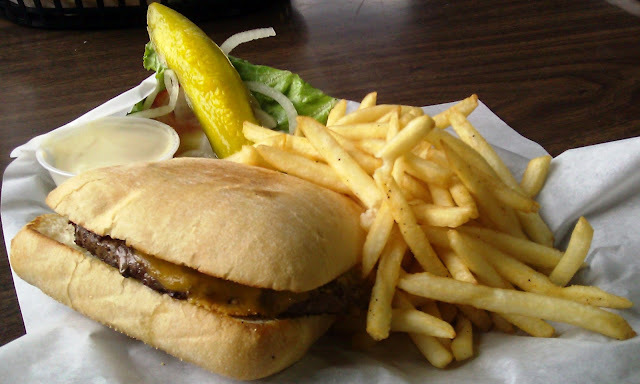 Burger Review : Terrific scenery and a fun ride. Sadly, what awaits one at the end of this particular rainbow is a dismally bland and over-priced cheeseburger. Pass. Editor's Note: Happy Meal and I returned, because he really liked riding the chair lift. On this visit, the burger was much improved. It was juicy and beefy. The bun was sweet and moist. The burger on this visit was just fine. That is one depressing burger. I feel sad just looking at it.